I Occupy, the new exhibition of Kasa Gallery in collaboration with the Museum of Contemporary Cuts surveys, analyzes and questions, current trends in interventionist art and Augmented Reality Art which, by intervening within the urban and socio-political landscape, contribute to redefine the aesthetic and cultural understanding of the environments we operate in. The Occupy Movement has catalyzed attention - nevertheless it has not really succeeded in creating the transformative change that people expected. And yet, it has succeeded in bringing on to the political arena the presence of a popular discontent about the escalating lack of participation and resulting erosion of democracy in the contemporary representation of the post-state. What is the actual social and political legacy of the Occupy Wall Street movement today? And further, what is the role of art in advancing political activism? 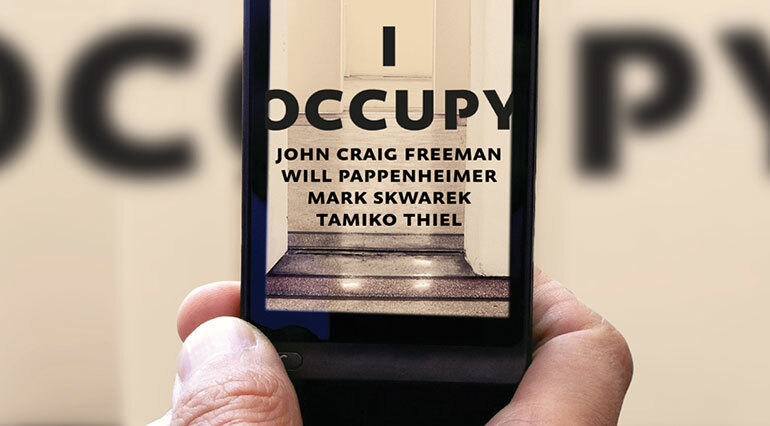 Do Augmented Reality interventions further Occupy’s claimed agendas? Does Augmented Reality art succeed in bypassing institutional control? Can this art practice exist without the autocratic and centralized stamp of approval of political bureaucratic institutions? The exhibition I Occupy will be prefaced by the text “Why I Occupy” by Nicholas Mirzoeff, world renowned scholar at NYU Steinhardt, as well as showcase the ARworks, actual live interventions, and documents of past events during Occupy in Wall Street, with pieces by Mark Skwarek (the organizer of the AR events), John Craig Freeman, Will Pappenheimer, and Tamiko Thiel. The exhibition showcasing these artists’ work will furthermore provide the opportunity for a panel discussion that will analyze the issue of art, politics and interventions in the public sphere in a technologically advanced society that allows for the creation of layers and tapestries in the urban landscape. These layers are no longer localized but part of increasingly globalized interventions that operate without and beyond the traditional - and perhaps obsolete - boundaries of national states. The exhibition I Occupy is concurrent to the show Jackpot at MoCC (Museum of Contemporary Cuts). Jackpot and I Occupy are a collaboration between MoCC, Kasa Gallery, OCR, Goldsmiths, NYU Steinhardt and the Royal College of Art. Senior Curators: Pat Badani, Nicholas Mirzoeff and Marquard Smith. Exhibition Dates: November 15 - December 31, 2013. Opening: November 15 at 5pm. Please bring smart phones and iPads to view the installations. Address: Kasa Galeri Bankalar Cad. No: 2, Karakoy, Istanbul. Visiting hours: 10:00 – 17:00 every day except Sunday. John Craig Freeman is a public artist with over twenty years of experience using emergent technologies to produce large-scale public work at sites where the forces of globalization are impacting the lives of individuals in local communities. His work seeks to expand the notion of public by exploring how digital networked technology is transforming our sense of place. Freeman is a founding member of the international artists collective Manifest.AR and he has produced work and exhibited around the world including at the Los Angeles County Museum of Art, the San Francisco Museum of Modern Art, FACT Liverpool, Kunsthallen Nikolaj Copenhagen, Triennale di Milano, the Institute of Contemporary Art Boston, and the Museum of Contemporary Art Beijing, He has had work commissioned by the ZERO1, Rhizome.org and Turbulence.org. His work has been reviewed in The New York Times, El Pais, Liberation, Wired News, Artforum, Ten-8, Z Magazine, Afterimage, Photo Metro, New Art Examiner, Time, Harper's and Der Spiegel. Christiane Paul cites Freeman's work in her book Digital Art, as does Lucy Lippard in the Lure of the Local, and Margot Lovejoy in Digital Currents: Art in the Electronic Age. His writing has been published in Rhizomes, Leonardo, the Journal of Visual Culture, and Exposure. Freeman received a Bachelor of Art degree from the University of California, San Diego in 1986 and a Master of Fine Arts degree from the University of Colorado, Boulder in 1990. He is currently a Professor of New Media at Emerson College in Boston. Will Pappenheimer is a Brooklyn based artist working in contemporary media art, performance and installation with an interest in institutional or spatial intervention and the altered meaning of things. His work often explores the confluence and tension of the virtual and physical worlds. His projects and performances have been shown internationally at LACMA, Los Angeles; the ICA, Boston; San Francisco MOMA; Stedelijk Museum in Amsterdam; FACT, Liverpool, UK; Kasa Gallery, Istanbul; Kunstraum Walcheturm, Zurich; Fringe Exhibitions in Los Angeles; the Museum of Fine Arts, Boston; Exit Art, Postmasters, and the New Museum in New York; the Corcoran Gallery of Art in Washington; the Golden Thread Gallery, Belfast; FILE, Sao Paulo, BR; Xi’an Academy of Art Gallery in China. As a founding member of the Manifest.AR collective, he has participated in two highly publicized interventions at the Museum of Modern Art, NY, 2010 and the 2011 54th Venice Biennial. The artist’s works have been reviewed in Christiane Paul’s recent historical edition of “Digital Art,” a chapter of Gregory Ulmer’s theoretical book “Electronic Monuments,” Art in America, New York Times, WIRED, Modern Painters, the Boston Globe, EL PAIS, Madrid, Liberation, Paris, and Art US. He teaches new media at Pace University, New York. Mark Skwarek is an artist working to bridge the gap between virtual and physical worlds with augmented reality. His art explores the aesthetics of translation of our everyday digital experience into material and immaterial audience experiences through physical and mediated artworks. Skwarek is a full time faculty at NYU Polytech where he is the director of NYU’s Mobile AR Lab and is the CEO of the start up Semblance Augmented Reality. He organized the augmented reality artist group manifest.AR, the arOCCUPYWALLSTREET movement, and co-organized We AR in MoMA. Skwarek’s practice is also largely based in art activism with emerging technologies. He has a long record of international augmented reality work, ranging from “erasing” the DMZ battlements between North and South Korea (a piece he did on site), to the virtual elimination of the barricades between Palestine and Israel, at the Gaza Strip. He has created political works and symbols in a variety of locations across the United States, including pieces at Wall St., U.S. Mexico Border and the White House to name a few. Skwarek earned his M.F.A. from Rhode Island School of Design's Digital Media Department. His artworks have been written about and reviewed by the New York Times, Art in America, Boing Boing, WIRED, the Boston Globe, The Huffington Post, NPR, BBC, Leonardo, and Creative Capital. Skwarek has exhibited in numerous international venues, including: the Institute of Contemporary Art, Boston; ISEA; Dumbo Arts Festival, UCLA Digital Grad Gallery; the CyberArts Festival; the Sunshine International Art Museum, Beijing; and the Krannert Art Museum at the University of Illinois, FACT in Liverpool England, Siggraph 2013, The 2013 Augmented World Expo, and The Corcoran Gallery of Art. Tamiko Thiel (USA/DE) is a visual artist exploring the interplay of place, space, the body, cultural memory and identity. Her work is shown internationally in venues such as the Corcoran Gallery/Wa.DC, ICP/NY, ICA Boston, Harvard University, ZKM/Karlsruhe, Tokyo Metropolitan Museum of Photography, Art Gwanju, Ars Electronica, ISEA, Istanbul Biennale and SIGGRAPH. Her artworks have been supported by grants from the MacDowell Colony, MIT, WIRED Magazine, the Japan Foundation and the IBM Innovation Award. She is Visiting Artist at Duke University, and augmented reality artistic advisor for the CCCADI project “Mi Querido Barrio” in Spanish Harlem/NY, for which she helped win a Rockefeller Foundation grant. A founding member of cyberartist group Manifest.AR, she participated in the path breaking augmented reality intervention “We AR in MoMA” at MoMA NY in 2010, and was main curator and organizer of the AR intervention at the Venice Biennial in 2011. Reviews of her work have appeared in publications such as Flash Art, Kunstforum, the New York Times, WIRED Magazine, El Pais and the Washington Post. Her work is discussed in reference books such as Whitney Museum media art curator Christiane Paul’s Digital Art (Thames and Hudson World of Art series), DAM gallerist Wolf Lieser’s The World of Digital Art and Cornell professor Matthew Smith’s The Total Work of Art: From Bayreuth to Cyberspace. Professor Smith also published a monograph on Thiel’s work, "Liquid Walls: The Digital Art of Tamiko Thiel," in the Performing Arts Journal (PAJ). She has been guest professor and lectured at institutions such as Carnegie Mellon University, the MIT Media Lab, Harvard University, the Bauhaus-University in Weimar/Germany, the University of Southern California School of Cinema-Television and the Berlin University of the Arts.